This summer, a group of students from Indiana University of Pennsylvania, along with their professor, are visiting our site in Jamaica. 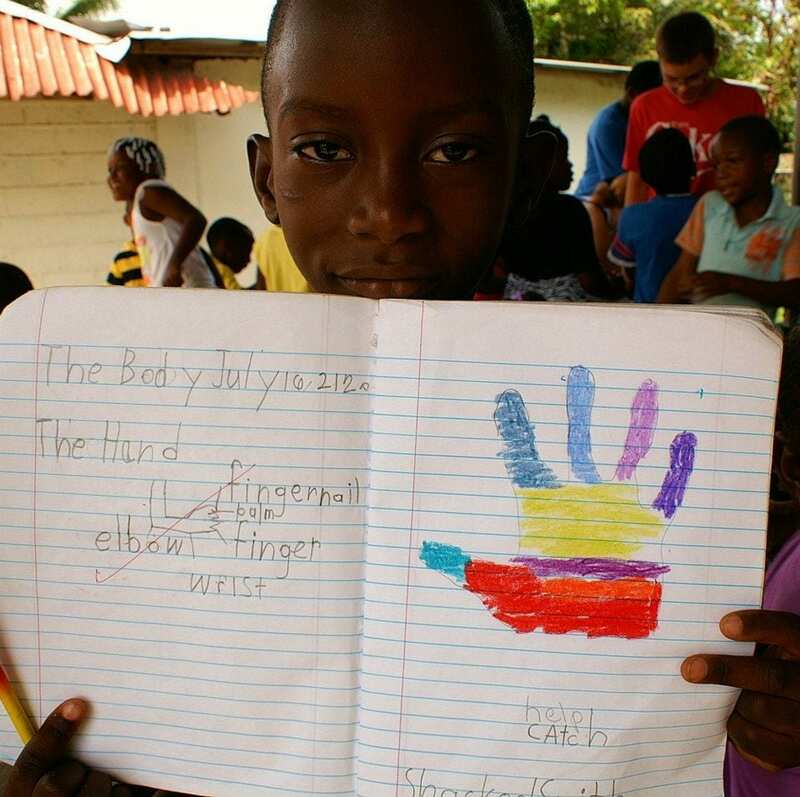 While in Petersfield the group will volunteer with Amizade’s community partner, the AOC at their annual summer camp, stay with local Jamaican host families, visit various Jamaica sites, and hold class sessions. Follow along with their program on our blog! We did our usual boarding on to the shaggin wagon express, our new mascot van, where we would be experiencing our first time at Roaring Rivers. We were crammed into our seats bonding with excitement as we were all enjoying the scenery and our new found love for the reggae music. We finally arrived to this new and unfamiliar destination where and they immediately collected our 500 Jamaican dollars (the tourists usually have to pay more!). 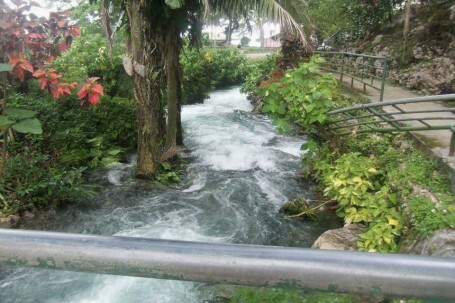 We began our journey across the rasta field to a beautiful roaring river. Before we started up the long path of steps we stopped to take it in and saw a gigantic cotton tree, it was magnificent, and something that was once used to use to make boats and canoes. We made our way up the long staircase standing in front of a sketchy cage and a dark tunnel. It’s rustic appearance shows us how the community has preserved this once hide-a-way for the maroons (run-away slaves), now it is a beautiful site. We entered the dark cave keeping to the right of the staircase filing down one by one. The first thing we saw were the tites and the mites, it is a column like structure that grows slowly over time connecting to the top of the roof to help support it. We walked through the cave witnessing the structures that were simply made by nature, like a lion kissing a monkey, a large fish carved into a crawl space, praying hands, the profile of an old lady, and even the face of Bob Marley with his microphone. Our guide led us into a mineral water pool where we each waited patiently in the cool water for a sulfur scrub down. Once we each had experienced a exfoliating massage (minus Chuck) we made our way to the bottomless pool. Here those who were able to swim had to walk down a ladder and jumped into the refreshing water and splashed around. We made our way out of the cave checking on each other and making sure we were all okay, and helping one another to get out of the cave. We didn’t even realize that this experience would bond us together for life. It’s now 10:30 and we’re starting work on a fence, finishing it tomorrow, and we will be on our way to Negril! Hi all! Yesterday we experienced our second full day of the AOC Summer Camp and we’re all starting to get into the swing of things. We love the kids here so much and they never fail to welcome us as soon as we arrive for the day. There are three groups of kids separated into kiddies, juniors, and seniors so we’ve all been experiencing each group as much as we can and they’re all very happy to have us. For part of the day they have a lesson and complete school work based upon the lesson, then we break for lunch which usually consists of delicious curry chicken and rice, and the rest of the day is fun and games. Some games include Simon Says, Mother May I, and soccer. After our day at the camp we decided to go to Roaring River for the second time (it was a scorcher)! Upon arriving at the river there was already a ton of people there having a party. Many of us jumped off the bridge again to cool off which felt amazing after our long day at camp. The people hanging out at the river were starting to get wild, blasting their loud rasta music which always makes for a fun experience. Yesterday we also had the pleasure of meeting Dr. Hildebrandt and her son Noah, our new additions to the group! They will be spending the next week with us here in Petersfield. Sadly, Dr. Swauger and Ben will be leaving us but we’ll never forget the one week we’ve experienced with them, it was all so amazing!